Note: Please consult our Play Store listing for the most recent changelog. 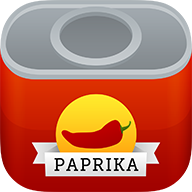 - Added support for exporting recipes to HTML or Paprika’s recipe format for sharing with others. This means that you no longer have to request support for specific sites to be added. Just press Save Recipe and Paprika will figure out the rest. - Fixed an issue with syncing. - Fixed an issue that could prevent the sync from completing successfully. - Fixed a crash related to ingredient scaling. - Fixed a crash related to grocery list consolidation. - Fixed more issues with opening .paprikarecipe attachments via email. - Fixed issues with sending and receiving .paprikarecipe attachments via email. - Made it more obvious when a search filter is being applied to the recipe list, to prevent people from thinking that their recipes have disappeared when they’ve actually only been filtered out by the current search terms. - Made it easier to add new categories. - Improved integration with the system web browser. - Made settings easier to access. - Fixed encoding problems when importing recipe files. - Made the recipe sort case insensitive. - Added the ability to cross off ingredients and highlight the current recipe direction. - Added the option to Clear Purchased items in the grocery list. - Simplified the browser clipboard tools so they are easier to access when using a phone. - Updated the back button's behavior. - Added support for importing MealMaster (mmf), MasterCook (mz2), and Living Cookbook (fdx/fdxz) files. - Fixed some very bizarre crashing. - Fixed problems logging into Paprika Cloud Sync. - Fixed problems with syncing recipe photos. - Added language support for French, German, Italian, Japanese, and Spanish. - Fixed bug where meals would not show up correctly on non US locales. - Fixed another bug where a recipe's categories would sometimes not sync correctly. - Added artwork for high resolution devices. - Fixed bug where a recipe's categories would sometimes not sync correctly. - Fixed category selection issue on Android 4.1. - Fixed browser clipboard tools on Android 4.1.